If you are looking for a sturdy, stylish, and sporty men’s watch, then check out the Invicta Men’s Russian Diver Chronograph Silver Dial Two Tone 246. Boasting many special features, it’s a high quality purchase. Fantastic Features: One neat feature is the chronograph function. Similar to a stopwatch, the chronograph function is the latest and greatest fashion. The Invicta 246 chronograph is comprised of three sub-dials: sixty second, thirty minute, and twelve hour. Clearly stated in its name, this diver watch is water resistant up to 100 meters, making it perfect for swimming and underwater adventures. If you tend to forget the date, the calendar function will remind you. Located at the twelve o’clock position, the date is displayed as a number. The crystal mineral case protects these important features while the black polyurethane strap with stainless steel barrels adds a sharp touch. Drawbacks and Comebacks: Although there are many fantastic features of the Invicta Men’s Russian Diver Chronograph Silver Dial Two Tone timepiece, there are some drawbacks to this watch dial that make it more difficult to view the time. One disadvantage of this Invicta model is that the minute intervals are only marked in five-minute increments. If you want a precise reading of the Swiss chronograph quartz movement, this makes it difficult to accurately tell time to the minute. While some hours are marked with Arabic numerals, index markers are displayed for the remaining hours. Although the lack of numeral markings is less ideal for the eye, the large size of the hour markings and index markers ease the readability of time. In addition, the hands are skinny which again makes it difficult to see the time. However, this is made up for by the matte silver and luminous color of the hands which increases their visibility. The silver background and black markings form a color contrast that also aids in your visibility. The 3, 6, and 9 hours form part of the sub-dials and are enlarged and close to the center of the dial. If you are looking for a more symmetric and traditional look, this dial design might appear odd to you. Although it’s different, you will likely enjoy its slick look once you become accustomed to it. 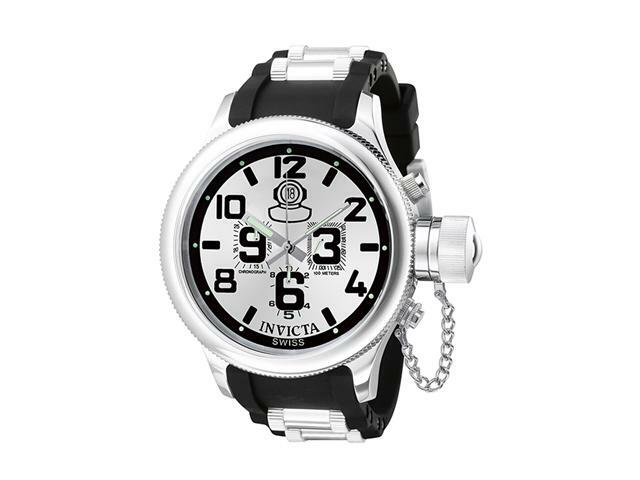 An Alternative: If you are looking for a more traditional look with every minute labeled, you might like the Invicta Men’s Quinotaur Russian Diver Quartz Ceramic Polyurethane Strap Watch 1936. It’s similar in style to the Invicta Men’s Russian Diver Chronograph Silver Dial Two Tone timepiece featured in this review, but does not have the chronograph function and has a black dial with white markings. Cost Factor: Although the U.S. retail price for the Invicta Men’s Russian Diver Chronograph Silver Dial Two Tone 246 timepiece is $595, you can find it for reduced prices. Currently listed at $135 at ewatches.com, you can find deals if you look online. Despite the fact that there are many excellent features of the Invicta 246 model, it also has some drawbacks that make it difficult to quickly and accurately tell time.